An exposed root surface is often associated with aesthetic issues, root hypersensibility and difficulty in maintaining optimal oral hygiene. 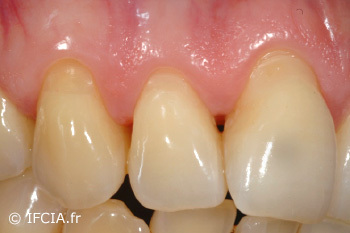 Despite controversy in the scientific literature on the sufficient minimum amount and thickness of keratinized tissue necessary to ensure the stability of marginal tissue contour in the long run, a thin biotype is considered one of the most important anatomical factors associated with gingival recession. Therefore, most root coverage procedures not only aim to completely cover the exposed surface and obtain a tissue blend, but also to increase tissue thickness to improve the stability of the long-term results. 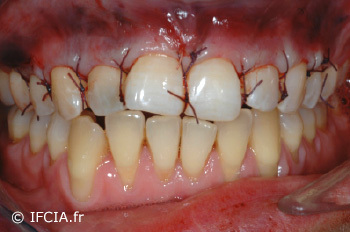 New techniques have recently been suggested for the surgical treatment of multiple gingival recessions. 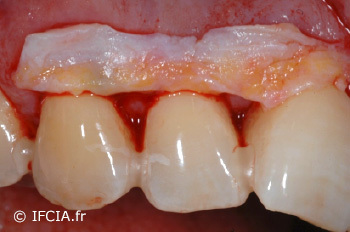 These techniques are principally derived from the coronally advanced flap procedure (Zucchelli & De Sanctis 2000) using the supraperiosteal envelope with soft tissue grafting (Allen 1994a) or its development, the tunneling technique (Azzi & Etienne 1998, Zabalegui et al. 1999, Tozum & Dini 2003). Fig.1: Maxilla multiple recessions. Pre-operative clinical view. The patient, a candidate for this type of intervention, must be free from any periodontal disease, in good health condition and present plaque control of <20%. 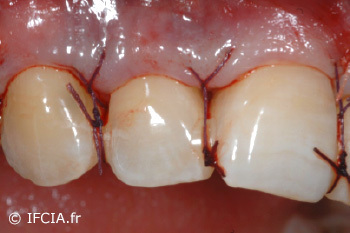 After a local anaesthesia, all concerned root surfaces are meticulously surfaced with Gracey curettes (Fig. 2). Fig.2 Upper right maxilla multiple recessions. Pre-operative clinical view. The first incision is made in an intrasulcular way with a tunneling knife. This is a straight or curved micro-scalpel for a dissection (Fig. 3). This dissection extends beyond the mucogingival line and under each papilla. In other words, all papillae will be tunneled in order to slide the graft (Figure 4) and move the flap coronally. The muscle fibres are gently dissected in the inner part of the flap. Fig.4: Clinical view of the connective graft to bury under the tunnel. This move allows for a tension-free flap which can be placed in a coronary position. (Fig. 5, 6). The donor site is prepared after the graft recipient site. Two connective graft techniques can be used. Fig.5 Positioning and coronal stabilisation of the tunnel and connective tissue (CT) complex. A palatal horizontal incision between the canine and the mesial root of the second molar allows a connective tissue graft to be taken without an external releasing incision (Hurzeler 1999). Fig.6: Suspended sutures stabilising the right and left maxillary complex (tunnel + CT). The other technique used is the distal wedge. Whenever connective tissue is available in sufficient quantity in the maxillary retromolar area, a sample can be taken. Here, the connective tissue is particularly dense (Azzi and Etienne 1998). Two parallel incisions are made in the tuberosity and the palatal incision is extended to the mesial portion of the second or first molar depending on the required quantity of tissue. Whatever the technique used, we obtain an adequate amount of connective tissue with a thickness not exceeding 1-1.5 mm. Immediately after sampling, pressure is applied to the donor site to ensure the first haemostasis. If the sampling is done using the single incision technique, the site is sutured using to the Borghetti technique (2000). On the tuberosity, the site is closed with crossed horizontal mattress sutures. On the receiving site, the graft is then inserted using sutures (Allen 1994). 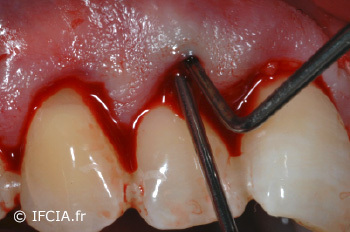 The needle is inserted at the end of the flap, from the outside to the inside, allowing the thread under the papillae. Thereafter, the graft is held with a vertical mattress stitch, slipped under the tunnel with the guiding needle and, finally, into the tunnel from the wider recession facilitating its positioning. The flap and graft complex is then brought and kept in the coronary position with suspended sutures around the contact points (Fig.5,6). These are closed with a flowable composite or Super Bond without using an etching beforehand in order to remove them easily with sutures. Suture removal is done at 15 days. The patient is asked to wait 24 hours after surgery to perform mouthwashes and not to resume brushing over the operated part after sutures removal. 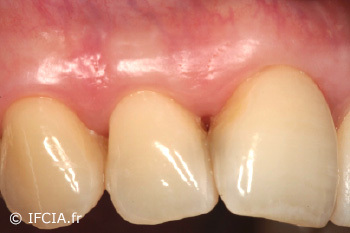 The advantage of this technique lies in the fact that the stability of the edge of the marginal gingiva is obtained in the first month (Fig.7). Studies have shown that stability can be maintained over the long term (Aroca et al. 2010, 2013) (Fig.8 to 10). Despite the promising results seen with this technique, we cannot say that all cases of multiple recessions can be treated using this method. However, literature shows that this is the only technique that provides predictable results for the treatment of Miller's Class III. At present, there are no comparative studies of the tunnel and the (modified) coronally advanced flap techniques for the treatment of multiple recessions in the literature. ALLEN, AL.Use of the supraperiosteal envelope in soft tissue grafting for root coverage. I. Rationale and technique. 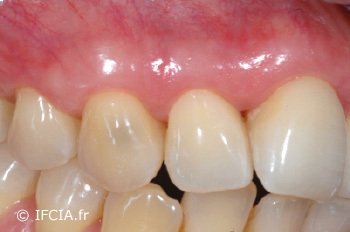 Int J Periodontics Restorative Dent. 1994; 14 : 216-27. AROCA, S., KEGLEVICH, T., NIKOLIDAKIS, D., GERA, I., NAGY, K., AZZI R. & ETIENNE D. Treatment of class III multiple gingival recessions: a randomized-clinical trial. 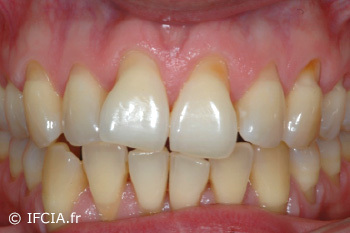 J Clin Periodontol 2010; 1 : 88-97. AROCA S., MOLNAR, B., WINDISCH ,P., GERA,I.,SALVI G.E., NIKOLIDAKIS ,D., & SCULEAN, A. Treatment of multiple adjacent Miller class I and II gingival recessions with a Modified Coronally Advanced Tunnel (MCAT) technique and a collagen matrix or palatal connective tissue graft. A randomized, controlled clinical trial. J Clin Periodontol 2013; 7 : 713-20. AZZI, R. & ETIENNE, D. Recouvrement radiculaire et reconstruction papillaire par greffon conjonctif enfoui sous un lambeau vestibulaire tunnélisé et tracté coronairement. JPIO 1998; 17 : 71-77. BORGHETTI A. MONNET-CORTI V. Chirurgie plastique parodontale. Collections JPIO. Editions CdP. 2000. HURZELER, MB, WENG, D.. A single-incision technique to harvest subepithelial connective tissue grafts from the palate. Int J Periodontics Restorative Dent. 1999; 19 : 279-87. TOZUM TF, DINI FM. 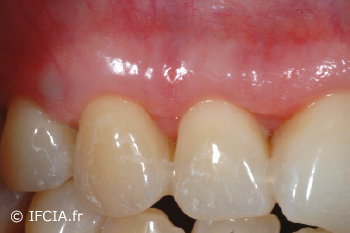 Treatment of adjacent gingival recessions with subepithelial connective tissue grafts and the modified tunnel technique. Quintessence Int. 2003; 34 : 7-13. ZABALEGUI I, SICILIA A, CAMBRA J, GIL J, SANZ M. Treatment of multiple adjacent gingival recessions with the tunnel subepithelial connective tissue graft: a clinical report. Int J Periodontics Restorative Dent. 1999; 19 : 199-206. 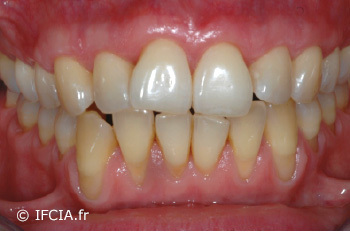 Private practice limited to Periodontology and Implantology, Paris. Associate Professor at the Department of Periodontology of the University of Bern, exercising periodontology and oral implantology exclusively in private practice in Saint Germain en Laye.